For drivers looking for the perfect combination of value and luxury, the 2018 Kia K900 is difficult to overlook. This impressive vehicle has been on the market since 2013, and the 2018 model is unchanged from the 2017 model that may have appealed to you over the course of the last year. This is a spacious sedan with a huge back seat for enhanced passenger comfort, and it is loaded with excellent features as standard equipment. All trim levels boast indisputable style and class, combining a rather sporty exterior with refinement throughout the interior. 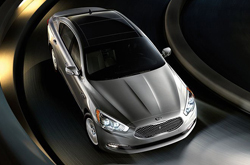 Its athletic appearance is defined by a robust grille, angled headlights, aggressive wheels and added flairs for accent. 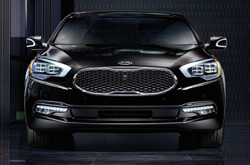 If you are interested in buying the 2018 Kia K900, you will be pleased to learn that there are two primary trim levels to choose from. These are the Premium and the more advanced Elite trim levels. Standard features vary slightly based on the exact vehicle that you select, but you can expect a wide range of common features in most K900 vehicles for 2018. This includes soft standard leather seating, power one-touch windows, remote access door locks, a navigation system, a tilt-away and telescoping steering wheel, steering wheel memory with a heated element, distance-pacing cruise control, cruise and audio functions on the steering wheel, dual zone air conditioning, a HomeLink garage door opener, remote keyless entry, wireless phone connectivity, an excellent sound system with exceptional Lexicon speakers, a CD player, internal memory, a color LCD monitor and more. The rear seats fold down with ease when you need extra space in the trunk. 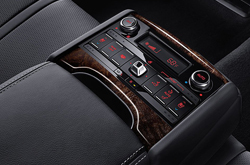 Altogether, you will discover that the interior design in the Premium and Elite trim levels boast exceptional luxury that puts this sedan in direct competition with other luxury cars on the market today. Both trim levels for the 2018 Kia K900 feature exceptional power and superior performance on the road. The Premium trim for 2018 boasts a 3.8-liter, V6 engine with 311 horsepower. The Elite trim is loaded with a more powerful 5.0-liter, V8 engine that delivers 420 horsepower. Regardless of the trim level that you select when buying the K900 for 2018, you can expect to enjoy an amazing time behind the wheel. Both trim levels come with an eight-speed automatic transmission, a Sportmatic manual shift feature, enhanced torque, a variable intake manifold, traction and stability controls, front and rear anti-roll bars, a four-wheel independent suspension and quality tires. When you test drive the 2018 Kia K900 at Camelback Kia, you will delight in its exceptional handling and performance in all driving conditions. As important as features, style and performance are when buying a vehicle, it is important to focus your attention on safety as well. 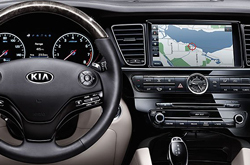 The K900 is loaded with the safety and security features that you would expect in a high-end sedan, and these can install a sense of confidence in you each time that you get behind the wheel. 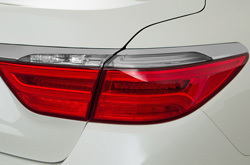 Some of these features in the 2018 model include xenon discharge lamps, a parking camera, forward and rear collision mitigation features, a trip computer, a lane departure warning, automatic headlights, sun blinds, a low tire pressure monitor, a blind spot sensor, a heads-up display, four-wheel ABS, perimeter approach lights, a security system, front and side airbags, overhead airbags, braking assistance, anti-whiplash head restraints and more. When you drive a luxury sedan that is loaded with exceptional safety features like the K900 is, you can feel safe and secure as you get around town each day.